My proudest bit of publishing was an alternate history centered on Angola that someone gifted me late one night. "Here's to bad men" was the takeaway of that fevered dossier, a strand of the story of what historians now brand the "lost decades" in Africa and elsewhere. 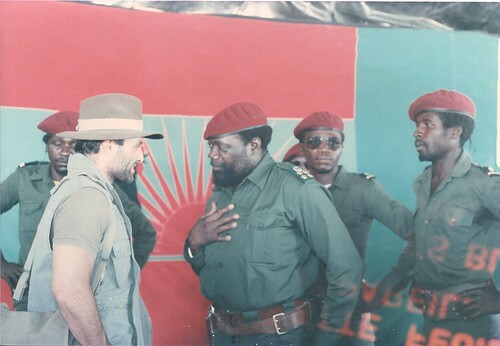 Stories are always unfinished, and the late KB Mensah shared some photos of Jonas Savimbi from his BBC archives that would have fleshed out that script. Also illuminating was Chester Crocker’s High Noon in Southern Africa (thank goodness for vanity, and used book stores). Its title and duel framing was inadvertently revealing; the outlook of cowboy diplomacy hard to resist. We have occasion to revisit the legacies of these political actors. 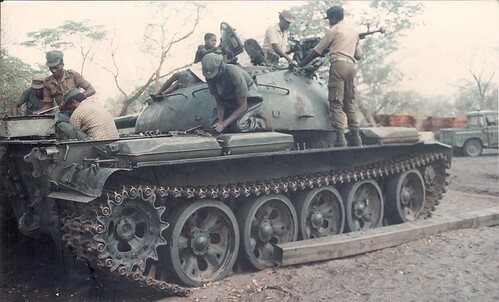 If the prevailing view from Kennebunkport was of a cold-blooded, Cold War, on the ground in Munhango and Cuito Cuanavale, however, there were warm bodies that bore the brunt of abstractions: domino theories, linkage and containment. Collateral damage aside, the rest of us bear witness. 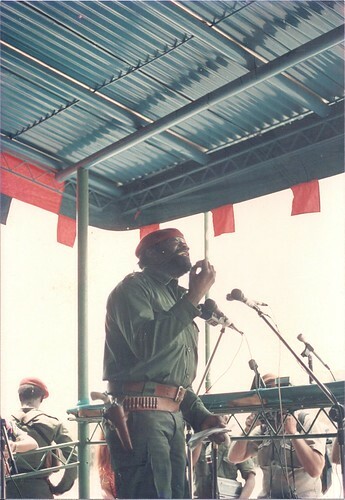 Apparently enough time has passed since the death of Jonas Savimbi that we are now urged to take a more nuanced view of his legacy. The caricature that was memorialized in the video game, Call of Duty: Black Ops II while apt for a rogues gallery of pulp fiction is said to be too simplistic. 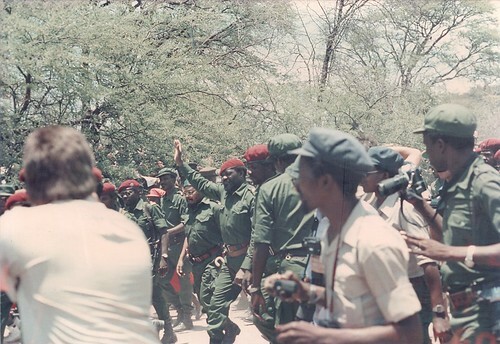 A lawyer for Activision Blizzard, Etienne Kowalski, has rejected the claim, stating that the game represents Savimbi as a "good guy" – and that he is portrayed fairly, "for who he was... a character of Angolan history, a guerrilla chief who fought the MPLA". The case was dismissed. The legacy remains contested. The elder Bush in death will face similar contests despite the patrician image, New England privilege and attendant Yale legacy. Reputations need to be managed. 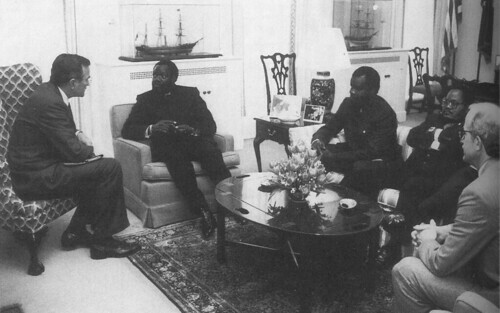 — Chester Crocker looked on as Vice President George Bush met with Jonas Savimbi in the Oval Office in January 1986 to discuss the United States' continued assistance to UNITA in the Angolan civil war. 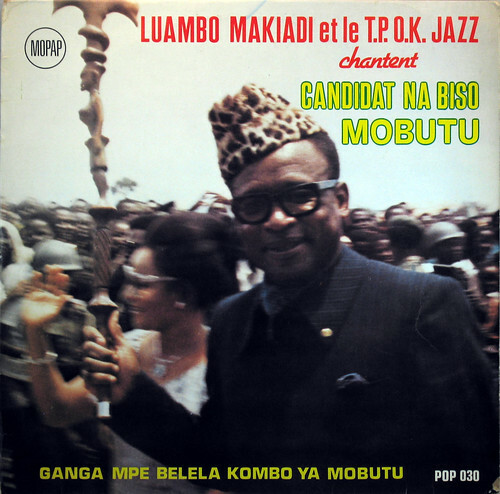 Item: Joseph Mobutu (a.k.a. Mobutu Sese Seko amongst other honorifics) was the most prized CIA asset in Africa from the 1960s until his death in 1997. He was a friend to every CIA director in his lifetime. Dig: The Bush and Mobutu families spent vacations together. The late Barbara Bush would recall in her memoir the visits with "President Mobutu, who wears a leopard skin hat and carries a tribal stick. He is very flamboyant, but charming." High Noon in Southern Africa makes a quite long winded defense of US foreign policy, arguing that it was all in service of "making peace in a rough neigbourhood". Diplomats often have do such things: putting lipstick on a pig or, to mix metaphors, making palatable the unsavoury. Still Crocker doth protest too much. It was never about clean hands, it was naked self interest. Being on the wrong side of history, supporting apartheid, propping up dictators will always be thrown back at one's face. 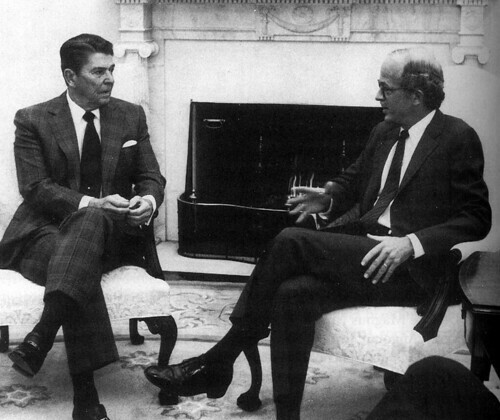 — Ronald Reagan and Chester Crocker at the Oval Office in November 1984 discussing the US policy to vigorously oppose sanctions on the South African apartheid regime. Ah right, Papa Doc and the Tontons Macoutes that ruined Haiti. Lest we forget. Squalid murder for the left of us, flowers to the right. The obvious problem with the Rumsfeld taxonomy of knowledge is that it ignores the "unknown knowns", that is, the unconscious biases that underlie an issue. This willed blindspot is the working mechanism of selective amnesia. We are living in a moment where nostalgia is key and we're anesthetizing ourselves with transactional, cowboy politics. There was a recent clarification which reminded me of the title of an episode of The Wire: moral midgetry. ... maybe he did and maybe he didn’t! Arms sales (and preferably ours). The B movie theory: manifest destiny revisited as farce. The politics of rehabilitation, reputation scrubbing, and legacies of blood and sin. In lieu of writing (checks to see the alarming length of time since I last clicked publish) as the parental cone of silence has enveloped those routines, I have managed to do some reading of late (and by reading I mean books, not the omnivorous web consumption that is our new normal) (and by books, I mean paperbacks - it's my practice to ensure that I am always behind the latest literary fashion). 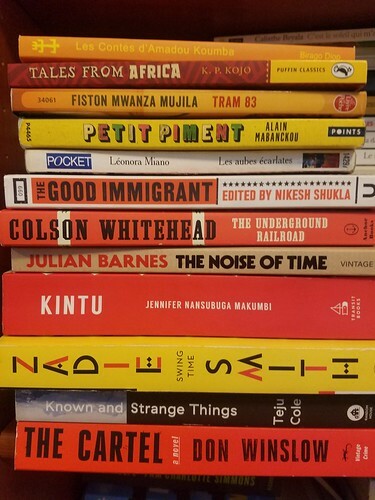 I've been pleasantly surprised that this past year's crop of books has nothing that should be best left unread, and indeed I recommend all of these. Herewith my year in books. An entertainment and a tour-de-force. The sheer bravado, humour and joy at work is remarkable. With every page, I grew ever more convinced that the future of the African novel is in good hands. Sidenote: it is so well crafted that it elicited the finest book review I've read in years. Apparently there's a good translation that manages to capture the frenetic energy and linguistic fireworks. There's a musical rhythm to the writing, classically one might call it a Greek chorus, but I would rather ascribe it to the the swirling multitudes of Papa Wemba. Taking a broader, pan-African view, I imagine a soundtrack by T.P. Orchestre Poly-Rythmo. When paired with Alain Mabanckou's wonderful earlier Verre Cassé (with which it almost rhymes), it is clear that we have been gifted a great cultural movement: literary sapeurs of the two Congos. The master is always more impressive when he writes in a personal mode. The focus on the young protagonists expands the range of the customary humour. Congo's Dickens is at work sketching journeys from the orphanage to gritty streets. Oliver Twist or Great Expectations. Nii Ayikwei Parkes' second collection of children's stories was a nighttime favourite for the kids. Encore! A Cameroonian take on the child soldier narrative. Haunting stuff that made for gripping reading. I will nitpick the ending - although I later realized that I had missed the fact that this was the third novel in a series. I'm with the 99%. Modern Britain is yet to come to terms with race and the probing essays in this collection broaden the perspective, lucid without being didactic, personal yet universal. I await the follow up on that deals with this side of the Atlantic. Hey, Oprah recommended it and man did he deliver. Applause all around. There was a vibrant literary scene at Harvard just as the dot com boom got going. Kevin Young, the late Philippe Wamba, and others all had oblique takes our modern condition. Colson Whitehead remains one of the most original of that cohort. Uganda sliced every which way. Read it. Savour it. Then read it again. A crowd pleaser from our greatest writer. Every detail works. Even this musical obsessive couldn't play gotcha. How's that, not even one anachronism; it isn't fair. Late era Barnes is no less ambitious than the young lion who gave us A History of the World in 10 1/2 Chapters. Pointillist precision on display. A late pass as ever, I'm forever fascinated by what he omits in his published works while grateful for what we do get. Here's willing him back to the blogging front. As Abbey Lincoln sang: Throw it Away. Epic in scope like its dark predecessor. The definitive take on the drug wars that are our ongoing predicament. I am savouring these modern Senegalese folktales with all their delicious twists. Having been brought up on Ananse stories and Arabian Nights, this is right up my alley. I treat myself to Diop's tasty morsels. He's my Peggy Appiah.